*Ask for details. Offer expires June 30, 2019. Limited supply. Cash price; not including tax. 246D model only. Cannot be combined with other offers. Store pickup only. *Ask for details. Offer expires June 30, 2019. Limited supply. Cash price; not including tax. 226D model only. Cannot be combined with other offers. Store pickup only. *Ask for details. Expires June 30, 2019. Undercarriage parts must be installed by Western States Cat to qualify for 30% parts discount. No cash value. Cannot be used on previous purchases or combined with other discounts. Not eligible with Corporate or National accounts. Western States Cat reserves the right to cancel or change this offer at its sole discretion. In-store only. *Ask for details. Expires June 30, 2019. No cash value. Cannot be used on previous purchases or combined with other discounts. Not eligible with Corporate or National accounts or on parts.cat.com. Western States Cat reserves the right to cancel or change this offer at its sole discretion. *For complete details, check with Western States Cat. Eligible machines for 0% inlclude: Mini Excavators, Compact Track Loaders, Compact Wheel Loaders, Small Dozers, Telehandlers, Skid Steer Loaders, Multi Terrain Loaders, Backhoe Loaders, and Small Wheel Loaders. Financing offer valid from February 1, 2019 to June 30, 2019 on select models of new machines manufactured by Caterpillar Inc. Building Construction Products Division only (mini excavators, skid steer loaders, compact track loaders, multi terrain loaders, compact wheel loaders, backhoe loaders, small dozers, small wheel loaders and telehandlers). Offers do not apply to Cat Utility Vehicles. To be eligible, a sales contract must be signed during the offer period. Offer available only at participating Cat dealers. Offer is available to customers in the USA and Canada only and cannot be combined with any other offers. Prior purchases do not qualify. Offer subject to machine availability. To receive the financing offer, all balances must be financed through Cat Financial, subject to credit approval through Cat Financial. Financing rate is subject to approval and not all buyers will qualify. Higher rates apply for buyers with lower credit ratings. Final machine prices are subject to change. Payments are based on an installment sales contract with 48 monthly payments and $0 down. Payment amounts are based on specific machine model and configuration. Payments may vary. Payments do not include taxes, freight, set-up, delivery, document fees, inspections, additional options or attachments. Offer is subject to change without prior notice and additional terms and conditions may apply. This offer has no cash value and is not transferable. **The cash back offer is only available on mini excavators, skid steer loaders, compact track loaders, multi terrain loaders and compact wheel loaders and is based on a predetermined amount for each machine model that is applied to the sale price. Cash back amount varies by model. Customers can apply cash back offer to the sale price of the machine only. The cash back offer can only be redeemed at a participating Cat dealer and must be redeemed on the date of purchase. Machines sold in Canada by authorized dealers are priced in Canadian dollars and the sale price and cash back offer may take into account the exchange rate of Canadian dollars to U.S. dollars. The two-year standard warranty is only available on Cat mini excavators, skid steer loaders, compact track loaders and multi terrain loaders. *Ask for details. Offer expires June 30, 2019. Must purchase valve adjustment and PM service combo to qualify for incentive. $100 account credit may only be applied toward future parts purchases at Western States Cat truck shop. Cannot be combined with other discounts or promotions. Offer excludes corporate and national accounts. Western States Cat reserves the right to cancel promotion at any time. 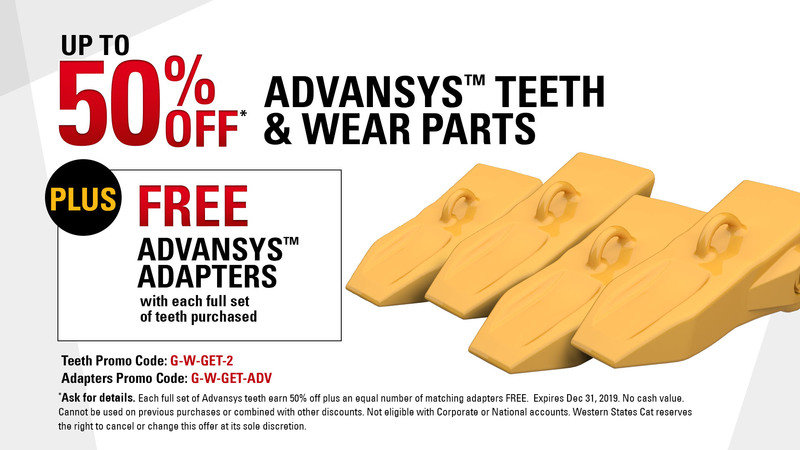 50% OFF ADVANSYS™ TEETH & WEAR PARTS. PLUS, FREE ADAPTERS! Replace your current tip-adapter system with CAT® Advansys™ and get 50% off each full set of teeth. Plus, receive an equal number of matching adapters FREE. *Ask for details. Each full set of Advansys teeth earn 50% off plus an equal number of matching adapters FREE. Expires Dec 31, 2019. No cash value. Cannot be used on previous purchases or combined with other discounts. Not eligible with Corporate or National accounts. WSECO reserves the right to cancel or change this offer at its sole discretion. Replace your current base edge and tip-adapter system with CAT® Advansys™ and get 50% off the base edge as well as 50% off a full set of teeth. *Ask for details. 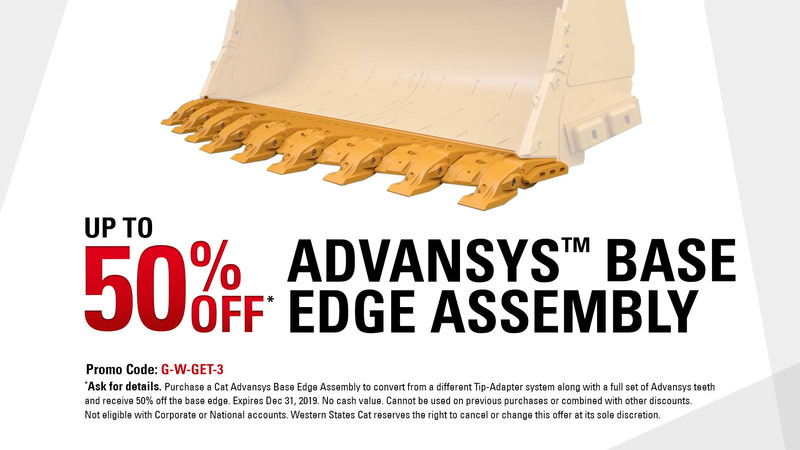 Purchase a Cat Advansys Base Edge Assembly to convert from a different Tip-Adapter system along with a full set of Advansys teeth and receive 50% off the base edge. Expires Dec 31, 2019. No cash value. Cannot be used on previous purchases or combined with other discounts. Not eligible with Corporate or National accounts. WSECO reserves the right to cancel or change this offer at its sole discretion.